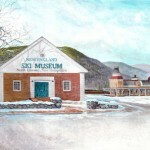 New England Ski Museum has always relied upon donations from the public to build its collections. In the years that the Museum has been collecting, many of the more common items associated with skiing have been acquired. For example, we have multiple issues of most of the major ski publications like Ski, Skiing, Ski Bulletin, and American Ski Annual. Due to limited storage space, we try to collect no more than two examples of most items. If you are considering donating material to the Museum, it is very helpful if you can contact us ahead of time to determine that it is something that the Museum is seeking. In general, the donation process works like this: When an item is received in the Museum, a Temporary Receipt is filled out by the Museum and signed by the donor. Within a few weeks, the Museum will make a final determination of whether the material will be accepted. If material is declined, it will returned to the donor or disposed of, according to the wishes of the donor as recorded on the Temporary Receipt. If the item is accepted, a formal letter of acknowledgement and two copies of the Deed of Gift is mailed to the donor. The donor is asked to sign one copy of the Deed of Gift and return it to the Museum, while retaining one. The item is given a number called an accession number, which is used to track that item henceforth. To eliminate any potential conflict of interest, and to comply with tax regulations, the Museum cannot appraise donated items with a dollar value. Donors seeking such an appraisal should consult an independent source. Donors should understand that artifacts on display in the Museum are only the tip of the iceberg of all material that the Museum holds. There is no telling when or if the items donated today will go on display. The Museum board and staff are aware that there is no way to predict what may be seen as important by future researchers and exhibit creators, so many artifacts are accepted for the collections that are not seen as immediately relevant today.